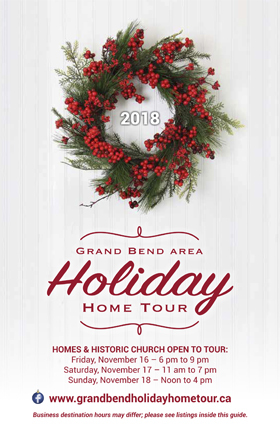 Visit four private homes and an historic church all decked out for the holidays. Also explore twenty-five destinations that provide holiday inspiration. Your ticket is good for one visit to each home throughout the weekend. Tickets are not required to visit the non-home destinations. Please check each destination ad for opening hours and details. Check out www.grandbendholidayhometour.ca and our Facebook page at www.facebook.com/grandbendholidayhometour for more tour info. unsung heroes who put many hours into creating this wonderful experience for all. Thank you for your support and we hope you enjoy the tour. HAPPY HOLIDAYS! THE JINGLE BELLS GROUP is comprised of folks from Grand Bend & Area Chamber of Commerce as well as from other area businesses and charitable groups. Our mission is to illuminate the core area with lighting, vignettes, greenery, etc.Join us for Light Up Grand Bend – Optimist Park, 5:30 pm, Fri., Nov. 16. OUR LADY OF MOUNT CARMEL SCHOOL will use funds raised for current and future projects. The 125 students in this rural school will benefit from technology improvements provided by the helping hands of these monies. HURON SHORES UNITED CHURCH in Grand Bend hascompleted the Sanctuary/Concert Hall and FellowshipHall renovations. Summer services are held during July and August in our green space. Planning is underway for indoor concerts. All are welcome. the weekend. Children must have a ticket, be accompanied by and supervised by an adult.